In India, the most used motorized mode of transport for school going kids is the School Vans and school buses. Across all the major cities and towns, this mode of transportation has gained huge popularity and have almost replaced the rickshaws. With working parents and long distances between schools and the residences, such school vans have become a lifeline for students to go back and forth to the school. However, not school or van would drop off or pick up kids on the doorstep of their homes. This asks for a solution such as School Van Tracking to be implemented. Usually parents take kids to the pick up spot and have to wait till the school van comes. Due to traffic uncertainty, it is hard to accurately maintain the timings for the drivers. This results in parents wasting their time in waiting at the pick up and drop off points. We, at Let’s Nurture, have developed a GPS and Geofence based school van tracking solution in the form of mobile app which allows the parents to know exactly when the school van approaches near their pick up spot. Same for the drop off. 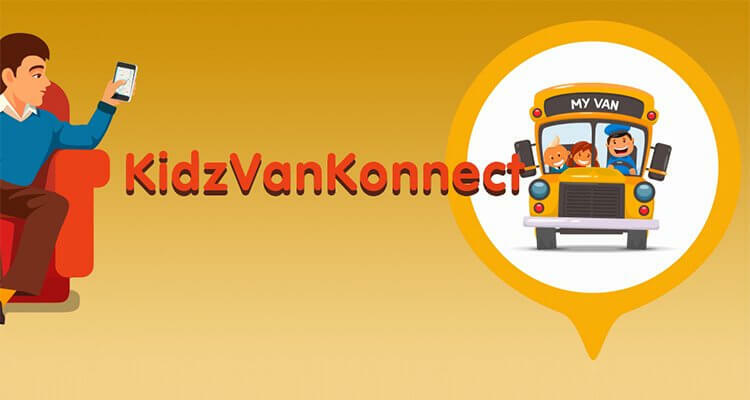 When the school van enters within 1-2 km radius of the designated point, the parents are informed about the same through real-time notifications. They can then plan their walk accordingly to the designated pick up or drop off point. School van tracking is an App based solution leveraging mobile app development which enables tracking of the phone of the school van driver. For this, the school van driver needs to download the Driver App. School van tracking solution is available for Android platform for now and will soon be followed by an iOS App. The driver creates an account and logs into the mobile app. The driver gets an option to “Start Trip” which enables tracking of the drivers van/bus. This enabled tracking of the school van using a mobile phone helps the parents to know where exactly the van/bus has reached. Parents in turn also need an App to track their kids. They download the App and create an account. Once account is created, they need to add their kids to the App. You can do tracking for multiple kids in this App. After adding kids in the App, parents need to assign the driver against the kid. Every driver is given a unique key. Parents need to add the driver key in the App and that is how the association of a driver for a specific key is done. Once that is defined, for every kid added by the parents, they can drop a pin on the map and assign pick up and drop off point for their child. Once this setup is done, as soon as the trip starts, the parents can locate the school van carrying their kid on the map with estimated time of arrival showing for convenience of the parents. School van tracking solution enables them to drop off kids at the pick up point in a timely manner without having to wait too long or risk missing out on the school vans. Same for the pick up. For further convenience, as soon as the vehicle enters in 1 Km radius of the designated point, a notification is generated and sent to parents. This informs them of the approaching school van or vehicle. This will provide accurate information of the vehicle location to parents which will better help them manage the pick up and drop off. For bit older kids to tend to walk home by themselves, this platform will help them to inform that their kids has been dropped off at a designated point and they can expect arrival of their child accordingly. In our quest to provide safe and secured transporting, this is our newest offering from the desk of KarConnect. What we offer as White Label Tracking solutions? We have expertise in website development along with Android and iOS applications to foster technological needs for your vehicle management. Through School Van Tracking Solution, we aim to give parents and drivers of School vans to leverage the extensive range of solutions using GPS technology. This IoT solution not only provides the real-time tracking but also helps to maintain the whole School van eco-system of pick up and drop off. We can also provide custom and white label IoT solutions with web and mobile apps for the educational institutes , automotive and other industries. Share your unique idea to us so that we can work upon making it a successful reality. Get a free quote now so that one of our business developers will get in touch with you!